The Canadian Tar Sands is the largest industrial project on earth. These deposits of a sand-embedded solid form of low-grade oil cover an area the size of Florida. Everything about the this project in the northeast corner of Alberta is enormous: sprawling open pit mines collectively the size of a large metropolitan area; mining equipment the height of a three story building; toxic tailings ponds that can be seen from outer space. But people far from Alberta are also starting to feel the effects of the tar sands’ massive footprint that includes inputs and outputs stretching across Canada, through the heartland of the United States, down the Pacific coast and across the Northern Rockies and Pacific Northwest. 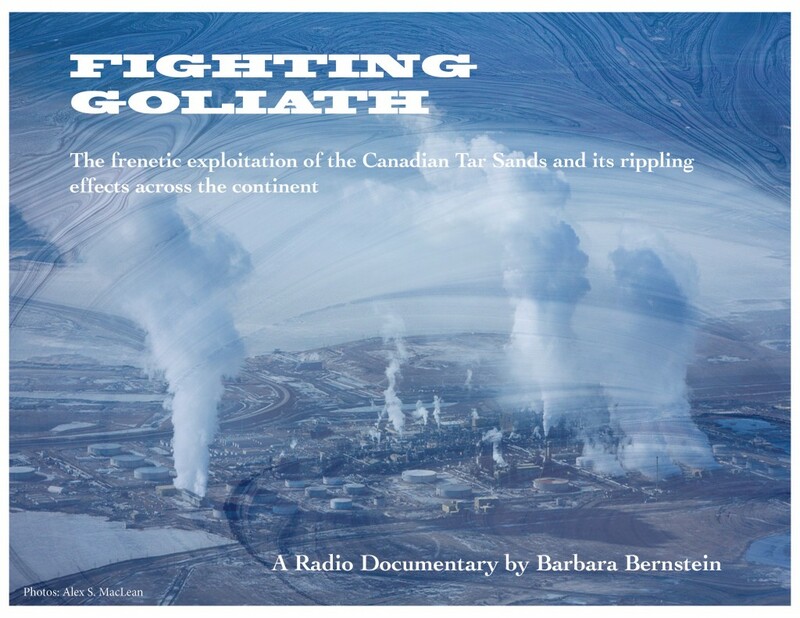 FIGHTING GOLIATH, a new radio documentary by veteran producer Barbara Bernstein, looks at the frenetic exploitation of the Canadian tar sands and its rippling effects across the continent. It tells the stories of three tendrils of the Tar Sands. One is an industrial megaload truck route for transporting massive mining equipment from Asia to the Tar Sands pits in Alberta, traversing wild and scenic river corridors in the Pacific Northwest and Northern Rockies. The others are two proposed pipelines to transport diluted bitumen over the Canadian Rockies from Northern Alberta to the British Columbia coast, crossing First Nations lands and a thousand pristine salmon streams. FIGHTING GOLIATH explores how the expansion of tar sands operations in Alberta raises concerns for communities everywhere. The documentary follows emerging movements resisting the multiple tendrils that extrude from the Tar Sands. It challenges listeners to think about ways to transform their personal and collective relationships to the sources of energy that they consume, since they are already filling their gas tanks with tar sands-derived gasoline.